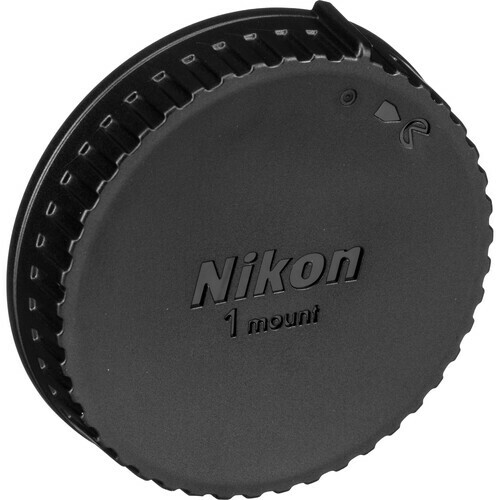 The Nikon LF-N1000 Rear Lens Cap for 1 Nikkor Lenses is a rear lens cap for the 1 Nikkor line of lenses used on Nikon 1 cameras. It protects the rear element of the lenses while the lenses are not attached to the camera. This is a replacement for the lens cap provided with each lens. Box Dimensions (LxWxH) 4.0 x 2.8 x 0.01"
LF-N1000 Rear Lens Cap for 1 Nikkor Lenses is rated 4.3 out of 5 by 4. Rated 2 out of 5 by camera girl from Nikon Lens rear lens cap Sad to say this didn't fit my lens, just should have looked a bit closer for better desc and measured my lens. I returned this item. Nothing wrong with product, looked well made. Rated 5 out of 5 by Roy from Protect your glass and keep it clean A required protector for any lens. It fits perfectly and is inexpensive. Much better than the pus on caps that tend to get chewed up and leave bits of plastic on the lens. Rated 5 out of 5 by mmmtanji from LF-N1000 Rear Lens Cap Nikon Great, well-constructed rear lens cap for Nikon Nikkor Lenses. does this rear cap fit the 24-120 Nikon lens? No, this lens will only fit the lenses for the Nikon 1 series of cameras. They are smaller sensor cameras and have a different lens mounting bayonet system (CX) than the DX and FX cameras which share the same mechanical fit.